^ Amos, Jonathan (9 December 2015). "Juice mission: Deal signed to build Jupiter probe". BBC News. Retrieved 9 December 2015. ^ Pultarova, Tereza (24 March 2017). 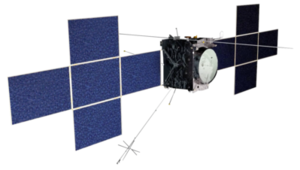 "Europe's Jupiter explorer mission moves to prototype production". SpaceNews. Retrieved 25 March 2017. ^ a b c "ESA—Selection of the L1 mission" (PDF). 17 April 2012. ^ a b "Esa selects 1bn-euro Juice probe to Jupiter". Jonathan Amos. BBC News Online. 2 May 2012. Retrieved 2 May 2012. 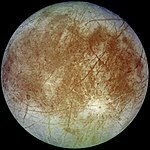 ^ "JUICE: Europe's next mission to Jupiter?". Emily Lakdawalla. The Planetary Society. 18 April 2012. Retrieved 2 May 2012. ^ "Disappointed astronomers battle on". Jonathan Amos. BBC News Online. 19 April 2012. Retrieved 20 April 2012. ^ "Preparing to build ESA's Jupiter mission". ESA. ESA. 17 July 2015. Retrieved 17 July 2015. ^ "NASA and JPL Contribute to European Jupiter Mission". Jet Propulsion Laboratory. NASA. 21 February 2013. Retrieved 26 March 2015. ^ Brabaw, Kasandra (30 July 2015). "JUICE-y Mission to Jupiter One Step Closer to Reality". Space.com. Retrieved 14 August 2015. ^ a b "JUICE—Science objectives". European Space Agency. 16 March 2012. Retrieved 20 April 2012. ^ "JUICE—Spacecraft". European Space Agency. 16 March 2012. Retrieved 20 April 2012. ^ "JUICE (JUpiter ICy moons Explorer)" (PDF). European Space Agency. March 2012. Retrieved 18 July 2013. ^ a b "Russia funds a proposal to land on Jupiter's moon Ganymede". Russianspaceweb. Archived from the original on 30 July 2015. Retrieved 25 August 2015. 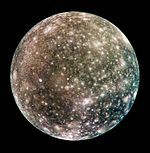 ^ "ESA chooses instruments for its Jupiter Icy Moon Explorer". CSW. ESA. 21 February 2013. Retrieved 17 June 2013. ^ "JUICE science payload". ESA. 7 March 2013. Retrieved 24 March 2014. ^ "The JUICE Instruments". CNES. 11 November 2013. Retrieved 24 March 2014. ^ "Jupiter Icy Moons Explorer (JUICE): Science objectives, mission and instruments" (PDF). 45th Lunar and Planetary Science Conference (2014). Retrieved 24 March 2014.